Croatian Apple Pie (Croatian word for pie is “pita”) is made with crumbly butter dough and cinnamon apple filling. 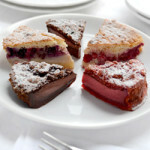 It is baked in rectangular pan and cut into squares. 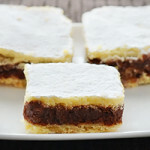 That is why more descriptive title for this recipe would be Apple Pie Bars. 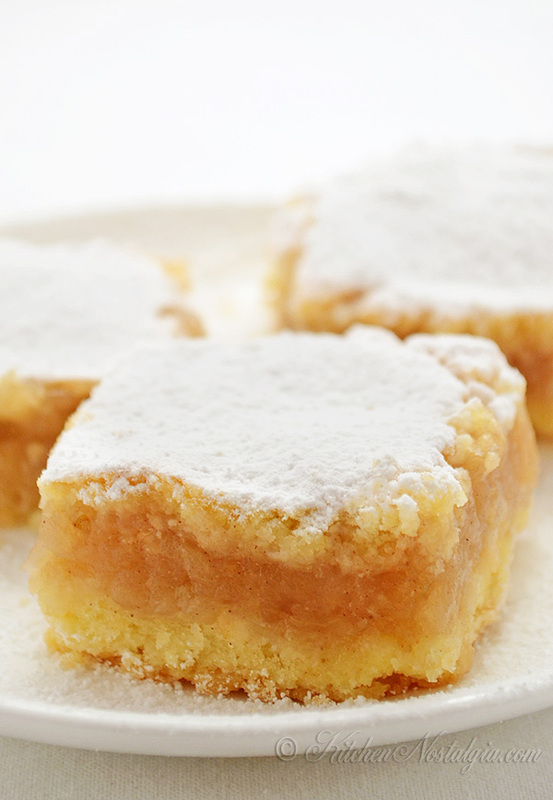 Croatian dessert recipes are not too sweet. So, if you have a sweet tooth, add some more sugar to the filling. Good thing is that you can taste the filling before assembling the pie, so you can adjust sweeteness to your liking. Let the bars cool a little bit before cutting because they are very soft when they are hot. 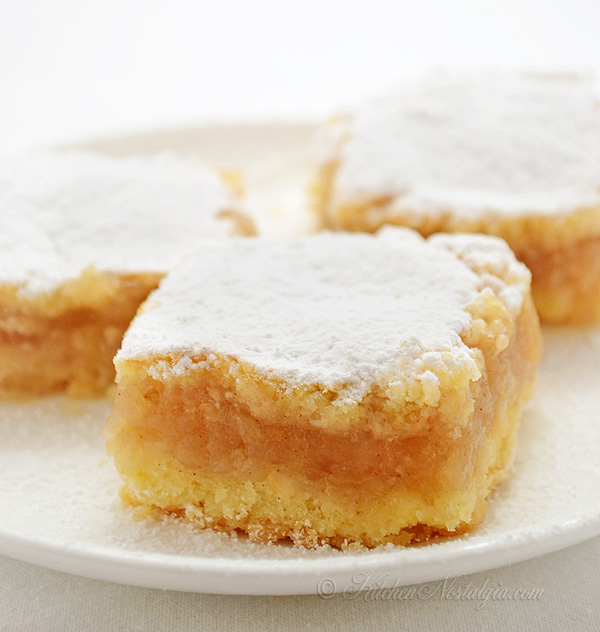 Apple Pie Bars (Croatian Pita) can be served warm with vanilla ice cream, or cold, sprinkled with powdered sugar. DOUGH: Combine flour, baking powder, egg, sugar and butter to make a dough. If the dough is too dry, add up to 1 Tbsp milk. Do not overwork the dough. Wrap it and cool in refrigerator for about 30 minutes. FILLING: Peel and grate apples. Mix with sugar and cinnamon. Adjust the sweetness to your taste. ASSEMBLE: Divide the dough in half. Roll out the dough with a rolling pin on a floured surface. Press one half of the dough into the bottom of the 9x13" baking pan and up the sides. Sprinkle with dry bread crumbs and spoon in apple filling. Cover with the top crust. Bake at 170 C (340 F) for about 45 minutes or until the crust is pale golden. 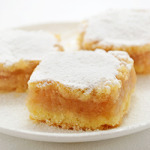 Sprinkle with powdered sugar, cut into squares and serve. Can someone help me on what a dag is on this recipe. I’ve never heard of it before & I would like to attempt making this recipe. What would the best apples be to use on this recipe ? Dag is a dekagram, meaning 100 grams. It is a measure used in Europe and Australia. In brackets you can see the same measure in pounds/ounces. I’ve just added measures in US cups – maybe it will be easier that way. 2) this measure is not universal in europe and australia. as a native english speaker and cook i have never heard of it and i have lived in both australia and europe. it seems to exist in germanic language, but is not popular in the romantic/english language european countries. some groups of migrant may use it in australia, but it is not mainstream. There are two problems here, indeed. One is that at the time of writing this post I didn’t know that decagram is not a unit used all around the world. I just copied the recipe from my own cookbook. Second is that I recently switched from old WP recipe plugin the new one which messed up my recipe measurements all over my site. For some reason it does not recognize parentheses. Originally I wrote “40 dag (400 g) flour”. In the meantime I decided it is the best that I don’t use decagrams at all since it just confuses people. Hi! Is it possible to make this without the bread crumbs? I want to try making this today but do not have any bread crumbs at home. Hi Sophie! It is possible to make this without the bread crumbs. You will have to use something else, like cookie crumbs or leftover cake crumbs, to soak the excess apple juice during baking. Hi, is it possible to make without egg? It probably is. In that case I would add more liquid. I’m so excited to make these. What kind of apple would you recommend? I use any kind I have at hand. Tart apples may need a little bit more sugar. Growing up my mother always made apple pita. After grating the apples she would always squeeze out as much juice as possible by hand. It helps in preventing the bottom crust from getting too soggy. I went to Croatia and Slovenia for a few weeks 2 years ago. Almost every other dessert was this apple pita/croatian apple cake and I fell in love. I had a recipe that I used and I lost it, and then I was happy to find this one. All was well for me except for the crust. The dough was on the dry, crumbly side (after cutting in the butter and egg ) and I ended up using sour cream to fix the dry crumbles. That didn’t do too much. I refrigerated the crumbly dough – fought with it to conform to a ball, and then rolling it out was quite the challenge. I ended up reworking the dough with water just to moisten the dough – not too much, and I was able to roll it out properly. Did I miss something? Was it too much flour? I followed your measurements in this recipe. I baked this last night, and haven’t tried it yet. I’m a little nervous. My husband is excited to try it, but I’m critical as the preparation for me wasn’t as easy as I thought it would be. From your description I would say that you did everything right. This dough is not the easiest one to make. It is very crumbly and it is hard to get it together while working. It is impossible to give exact recipe because sometimes the egg can be a little bit too big or too small, the flour can be too dry or too moist. So, you always need to adjust it by adding a little bit of sour cream, milk or water, just as you did. One needs to be very careful not to add too much liquid because then the dough ends up being chewy and it looses this crumbly falling-apart quality (we have a special word for it: “prhko”). It is also important not to knead it at all, just to press it together with your hands. If you find it too difficult to roll the dough, you can press the first half of the dough with your hands to the bottom of the dish. 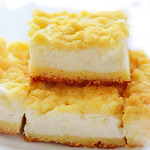 You can crumble the second half on the top of the filling or grate it using a hand grater, as I did with my Cream Pie Bars. I’m sorry that you didn’t taste it to tell me whether you liked it. I did get to try it, and I liked it! 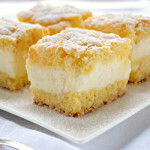 It was flaky, crumbly and reminded me of a shortbread consistency. Very tasty. I actually appreciate this cold! I fought with the dough, but the end result was great. I’ll try your method above – pressing it into the pan rather than trying to roll it out. I actually cried when I saw this recipe. My Oma who grew up on the border of Belarus and East Prussia made this all the time for us as children. She died before I could get a recipe from her and I have been searching on line for something similar but have only seen apple cake or apple pie or apple strudel. I’ve tried to explain that you roll out two levels of dough and put thick apple sauce in between but no one has ever heard of this. I thought maybe she put a bit of yeast in her dough but I’m not sure. 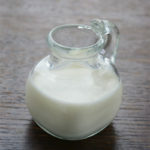 As children we would see who could eat it without dropping any sauce out the sides! I’m so excited to try this!!! !